We are instrumental in exporting and supplying the best quality Acetone. The Acetone that we offer an organic compound, which is used as the solvent of choice for cleaning purposes in the laboratory. Additionally, this water miscible solvent is also used by the pharmaceutical industry as an excipient and as a denaturation agent in denatured alcohol. 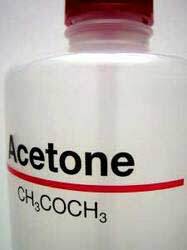 Avail from us, this quality tested Acetone at very reasonable prices in the markets.